BEFORE YOU READ ANY FURTHER, PLEASE NOTE THE FOLLOWING. I cannot stress enough that it's important, if possible, to see this movie with as little foreknowledge as you can. Don't Google a trailer. Don't look at a poster. Don't even scan your eyes over the press photos used in this review. If you can, just avoid anything to do with this film's marketing, and go see it unmolested. 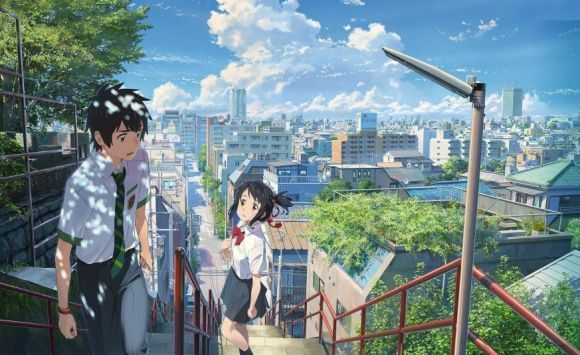 Words cannot describe how much I loved Your Name, but a lot of that love comes from knowing as scant as possible about it; its premise, its characters, its plot turns. Although most of the current media surrounding the film has been fairly good with keeping the major stuff hidden from view, there are some things you could still infer. Therefore, if there is any Faustian bargain you can strike to completely block out anything resembling anything to do with Your Name before you see it, go do that. For those who are after a hot take or a nice shiny review score before you determine if you'll watch it - Your Name is a stunning, impactful, moving, funny, beautiful and emotional masterpiece of an anime about two people who are wonderfully and intricately drawn characters, both inside and out. To skip to the end bit, I will be giving it 10/10. It is a movie you should already be going to watch, and I would strongly recommend you stop reading right here. For the rest of you, the review will be as vague as possible while still informative, but you should be aware there may be SOME MINOR SPOILERS IN THE FOLLOWING REVIEW. YOU HAVE BEEN WARNED. 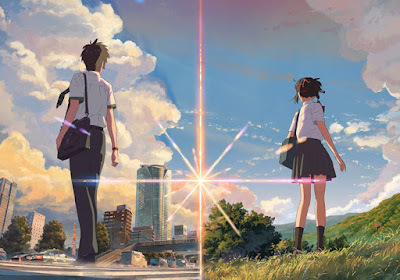 It'd be mighty unprofessional of me as a critic to just say "Your Name is one of the best anime films I've ever seen, go watch", and then call it a day. But trust me when I say that that option sounded really tempting when I set out to write about it. A lot of the praise I'm going to give it is rooted squarely in the fact that I knew almost nothing about it beforehand, and was pleasantly surprised by what unfolded. The poster - the only piece of film advertising I'd seen - gave the impression of it being a high school romance-drama hybrid between two young lovers. Given that I'm more into things like Attack on Titan, the Evangelion series and the Madoka Magica movies, you could probably tell that such a film would not be closely aligned to my interests. But I'll be damned, Your Name was a soaring, towering masterpiece of an anime. 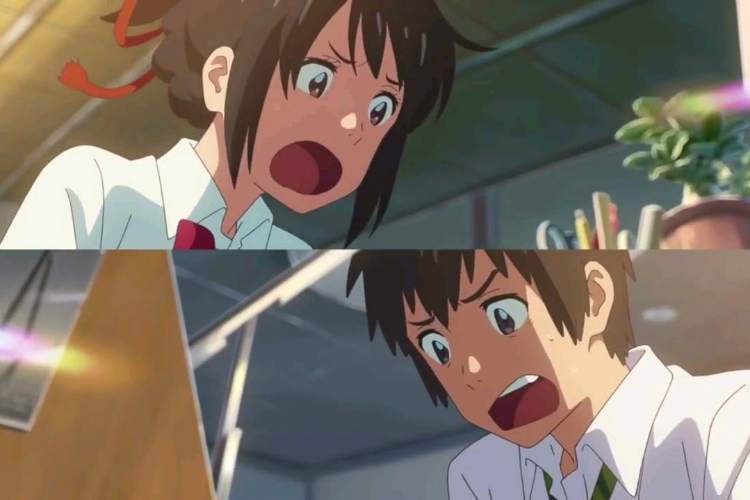 Directed by Makoto Shinkai, the film is the story of two teenagers living in different parts of Japan; Taki is a cocky, arrogant young man living a busy life in Tokyo, whilst Mitsuha is a sweet and sassy young woman doing her best to make it through a banal existence in the rural town of Itomori. 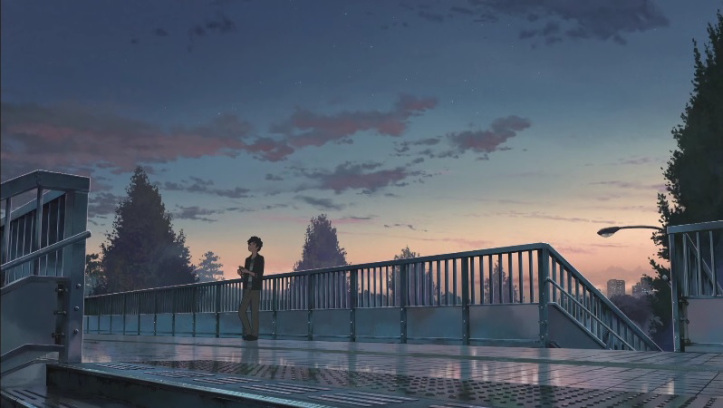 Both their lives are changed when a comet closely orbits Earth for the first time in over a thousand years. 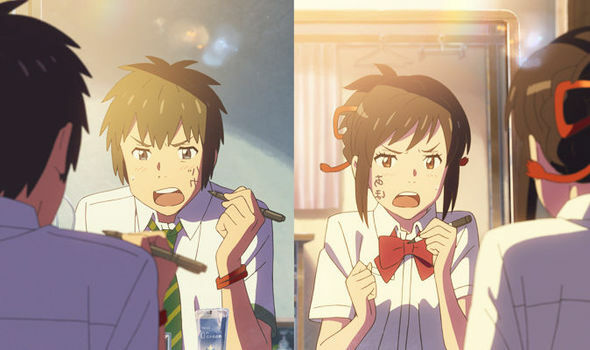 As a result of some vaguely magical effects stemming from said orbit, Taki and Mitsuha start uncontrollably body-swapping with each other. After a period of adjustment (and no small amount of self-groping, in one of the film's funniest running gags), both teens start helping each other to make positive changes in their respective lives. Of course, once that starts happening, they get the urge to meet each other. That's as far as I'll go with the plot, but trust me when I say that the Freaky Friday-style narrative beats are not as simple as they first appear. Underneath an external appearance of giddy, emotionally-light quasi-sci-fi fare lies the beating heart of a story that will put you through a number of emotional wringers before the end. Have you ever bit down on a piece of nigiri that you thought was just salmon and rice - perfectly delicious and enjoyable - only to find that there's wasabi hidden in-between both things, injecting an unexpected flavour into your eating-based proceedings? Your Name is kind of like that, particularly if you're into wasabi. 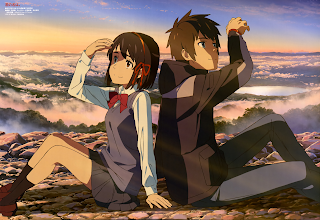 quite quickly in what Taki and Mitsuha are going through on their own and with one another. 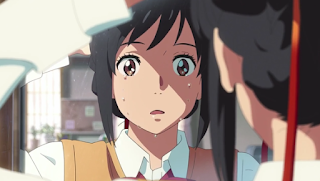 The supporting players are also well done, with a special note given towards Mitsuha's high school friends Tessie and Sayaka, who spend the entire film as the most effective narrative "those two guys" in recent memory. 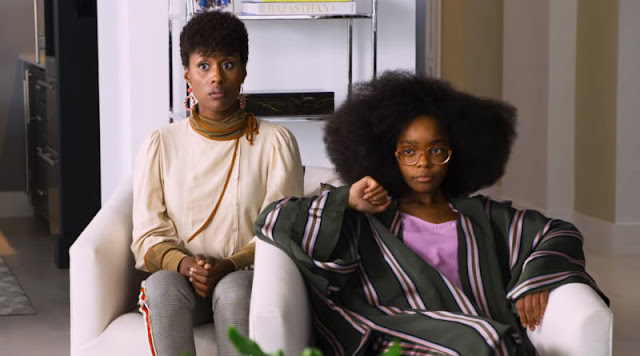 This means the film taps into its emotional power by strongly grounding the drama in some very human, relatable people, rather than in the specific mechanics of the body-swapping itself or the possibilities for mischief that entails. Those looking for anything beyond a surface level explanation for it will be left unsatisfied - but I mean really, can't you tell it's all happening because of the comet? Magic, folks, come on, it isn't that hard to accept. The above are all wrapped up within a moving, powerful tale of identity and love. Some movie and anime veterans will almost certainly guess a few of the big plot turns before they happen - there was one massive one which I picked moments before it was spelled out on-screen - but rather than defuse part of the film's tension, it just switches it to another track. If you're able to predict where Your Name is heading, it'll create a certain kind of emotional anxiety that only ratchets that tension up to another level. By about the halfway point, I discovered I had absolutely no idea where we were headed, but with what we'd learned about the plot and characters by that point, I had a feeling of a few paths the film could have decided to take, all of them carrying at least a little bit of that emotional anxiety, and all of them loaded with the possibility of turning me into a human faucet with a broken tap. While I won't say if Your Name took any of the paths I envisioned, I will say - as should be evidenced by that nice big 10/10 down the bottom - that I did not leave unsatisfied. Quite the opposite. I really wish I could say more, and under normal circumstances I would be fine throwing out a few more hints about plot developments and character progression in the body of the review (for instance, look no further than my blunt assault on the plot "twists" of the latest Harry Potter atrocity). But I'm under the impression that most of my audience come here for recommendations, rather than a post-film discussion forum to chat over specific plot turns (though, of course, I'd love it if the latter happened, too). The fact is, you're probably still reading because you haven't seen Your Name yet, and weren't suitably warned off by the opening. If you were waiting for any more justification as to why you should go see the film, there's not much more I could say to convince you without going into unnecessary details. Your Name made me laugh a lot, and weep into my sleeve. It had some of the most gorgeous anime vistas I've ever seen, along with a soundtrack that was pitch perfect for each scene it underscored (though I could do without the gratuitous J-Rock). It was both a fine bait-and-switch misdirection and a genuinely heart-wrenching story in its own right. As I said before, you should have seen it already. Your Name opens in cinemas in Australia from November 24th. Geek of Oz would like to thank Madman for their invitation to the press screening for this film.